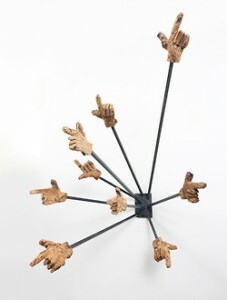 Pointing is a one of a kind wall-mounted sculpture made of carved wooden hands on a steel structure, measuring 21″ x 23″. Dave Rittinger is a Brooklyn based artist and designer whose work is often playful, contextual, and opportunistic. Embodying a sense of humor and dueling spirit of critique and optimism he makes work that relates to our contemporary place in time through the embrace of wry subject matter and eccentric selection of materials. 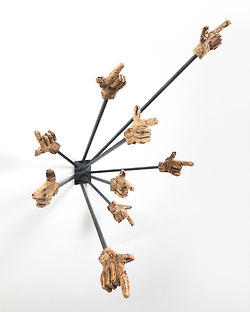 Dave Rittinger’s sculptures and prints use brightly playful objects like neon squirt guns and toy soldiers to touch on larger issues like the normalization of violence. 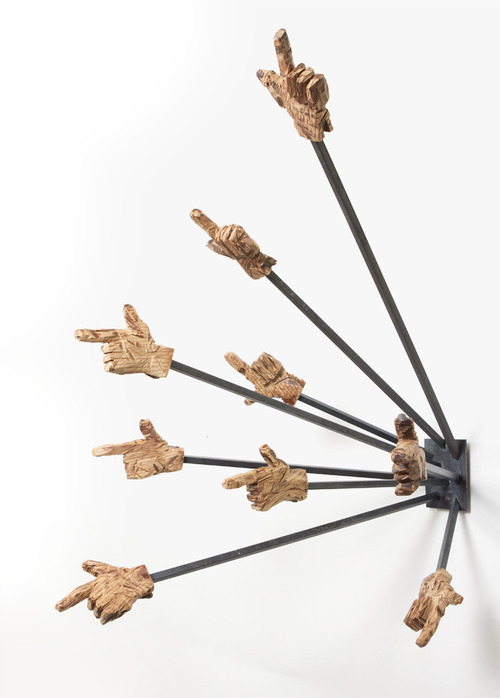 Pointing is a one of a kind wall-mounted sculpture made of carved wooden hands on a steel structure. It measures 21″ x 23″ and attaches to the wall with a single screw or nail.